Did the US Air Force Lose High Tech Missile in Syria? Image on the right: BGM-109C Block III Tomahawk land attack cruise missile. The missile is equipped with a solid propellant rocket booster and discarding two-piece canister to facilitate launch. Image on the left: JASSM being loaded into the internal bomb bay of a B-1B Lancer strategic bomber. Image on the right: JASSM being successfully test fired from an F-15E Strike Eagle. The JASSM development parameters demanded that the next generation air launched cruise missile be compatible with multiple strike, maritime patrol and strategic bomber aircraft in the U.S. and NATO inventory. The JASSM has been purchased by the militaries of Poland, Finland and Australia. 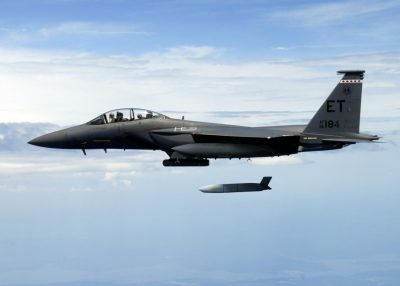 The missile was initially designed to be utilized by the U.S. B1-B strategic bomber; however, from the very start, it was envisioned that the missile be compatible with a broad spectrum of U.S. aerial platforms, including the F-16C/D, F-18C/D, F-15E, F-35 strike aircraft, as well as the B-2 and B-52 strategic bombers. The P-3 Poseidon may also be a candidate for use of a modified anti-ship cruise missile currently being developed using the JASSM-ER as its foundation. The Long Range Anti-Ship Missile AG-158C (LRASM) is currently being developed by Lockheed Martin as a next generation sea and air launched anti-ship cruise missile meant to defeat near-peer or peer naval targets. There is little doubt that the LRASM is being developed to counter the exceedingly modernized and capable warships developed by China and Russia over the past 25 years. The People’s Liberation Army Navy in particular, has been developing and commissioning extremely capable warships at a rate far exceeding any other navy in the world. As its attention continues to focus on militarization of the South China Sea and Chinese A2/AD, or access and area denial capability in this region, the U.S. Navy will have to develop a more viable means by which to engage and defeat exceedingly capable PLAN surface warfare platforms. Image on the left: Computer generated rendition of a LRASM targeting a Russian Sovremenny Class destroyer.